SOFIA—The Fourth International Conference of Buddhist Women, titled “Buddhism and Sustainable Development,” was held in Ulaanbaatar from 31 October–1 November. Hosted at the National University of Mongolia, The conference brought together 140 participants and 36 speakers from Australia, China, Hungary, Mongolia, Russia, South Korea. The aim of the conference was to present fundamental Buddhist concepts such as compassion in enhancing the social responsibilities Buddhists, and to analyze different aspects of Buddhist culture and education. This goal was achieved through cooperation between civil and Buddhist organizations, research and training activities, and through encouraging creativity and disseminating of the work of researchers. The forum was organized by the association of Buddhist women in Mongolia Buman Khand (Million Dakinis) and the Department of Philosophy and Religious Studies at the National University of Mongolia (NUM), with the cooperation of the Mongolian Association for Study of Religion and the Mongolian Association of Tibetan Studies. Welcoming addresses were given by Prof. Dr. P. Delgerjargal (vice director of the humanities section of the NUM’s School of Sciences), Venerable D. Choijamtso (abbot of the Centre of Mongolian Buddhists at Gandantegchinlen Monastery), Ts. Khulan (cultural and religious policy advisor to the president of Mongolia), Assoc. Prof. S. Yanjinsuren (director of the Mongolian Association for Tibetan Studies), Prof. Dr. B. Dagzmaa (head of the NYM’s Department of Philosophy and Religious Studies), Prof. Dr. S. Tsedandamba (head of the Association of Researchers of Religion), and Dr. Birtalan Ágnes (president of the International Association of Mongolian Studies and professor at the Department of Mongolian and Inner Asian Studies at Eötvös Loránd University, Hungary). The National University of Mongolia and the other cultural institutions expressed support for the conference mainly because the role of women in the Buddhist tradition of Mongolia is a topic that is still not well explored. It was recently included in the academic endeavors of these institutions as a new area of study. 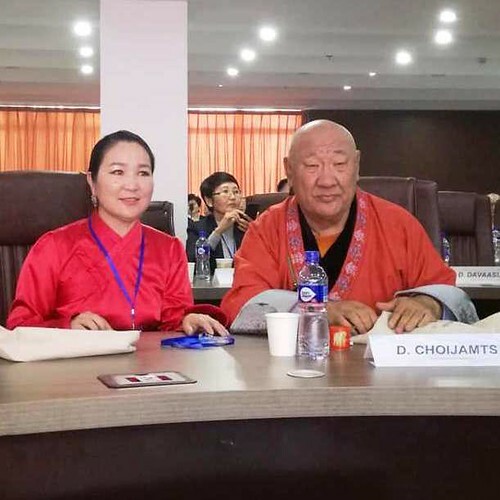 Topics discussed during the conference included the Buddhist culture of Mongolia, traditional and modern Buddhist philosophy, religion and politics, Buddhist women, Buddhist art, Buddhist reform, environmental conservation, medicine, and family education. The topic of Buddhist women was presented through an analysis of their precepts, vows, education, and ethics. The lives of women during the period of political purges and pressure was also explored. Kunze Chimed, left, one of the main conference organizers, and Venerable D.
Another fascinating topic was the life of Buddhist nuns and khandromas (Tibetan translation of dakini)—female lay practitioners with special spiritual qualities. Their struggles and challenges were the subject of discussion by the scholars. Among the distinguished speakers was Venerable Thubten Gyalmo (Glenda Lee) from Western Australia, who moved to Mongolia in 2008. She presented the life of Western Buddhist nuns, including their precepts, training, and the challenges they face. The scholars, researchers, and monks discussed a number of issues faced by Buddhist women and brought the attention to some of their current problems. The conclusion was that the preservation of this unique facet of Buddhist society requires cooperation and the active participation of numerous stakeholders. The First Conference of Buddhist Women was held in 2014 at Gandantegchinlen Monastery, the biggest monastery in Ulaanbaatar. During the third conference in 2016, Buman Khand was founded to help Buddhist women in Mongolia preserve and spread their tradition. Kunze Chimed,one of the main organizers of the fourth conference, was elected as the first leader of this NGO.